Why aren't alien planets as varied in climate as the Earth? The Earth in all of its varieties has wide ranging climates. At the top level it has tropical, dry, temperate, continental, and polar climates. And yet often the planets depicted in science fiction are often single climate planets. The outer planets in Firefly all appeared to be mostly desert (supiciously like Calfornia desert). The inner planets in Firefly were all temperate or tropical. I'm not suggesting there are no Earth-like planets in science fiction, but it feels like it is less common than it should be. Considering the only planet we have as an example is our own, it seems like planets should be just as varied in the cosmos. Planets in outer space will often be defined by a single setting. It doesn't matter if the events of the story only take place in on a small portion of the planet — we are still told the entire planet has one climate; specifically, the same climate as where the story takes place. Very rarely does any planet have the same level of environmental diversity as Earth, despite being as large and having a normal orbit. An ecological equivalent to the Planet of Hats. See the link for a more complete description and a pretty long list of examples. It also discusses when single biome planets can be justified. Personally I am often annoyed by the frequent occurrence of this trope in mainstream SF and Fantasy (although the latter also often succumbs to the opposite, Patchwork maps). It can make an entire world flat, uninspiring and implausible, and I would advise any aspiring SF writer to avoid this at all cost. Since humans evolved on the Earth, we're sensitive to its climatic variations. -10C is arctic, +30C is tropical. Alien planets are unlikely to be centred around the temperature ranges that humans find comfortable. If a planet has as much variation as the Earth but in the range -60C to -20C, it's all arctic. If it's +30C to +70C, it's all hot (and much of it is probably uninhabitable). There are several reasons science fiction worlds do not suffer the climactic variability of Earth. Increased simplification of writing or display in media, lack of scientific knowledge of writers regarding weather and climate, and unless weather is an active participant in the story, it is more a window dressing or stage setting than something to be focused on as an element in a story. Easier to write about if the entire planet is one giant ecosystem of one type or another. Readers or watchers say, "oh an ice planet" and are able to move on to the next part of the story. This trope is far more common than you realize. Watch any modern science fiction and you will see this trope in action. Writers are often limited in their understanding of the causes of weather, the development of climate, or environmental conditions contributing to weather. So, when in doubt, they make the entire world that way and move on. 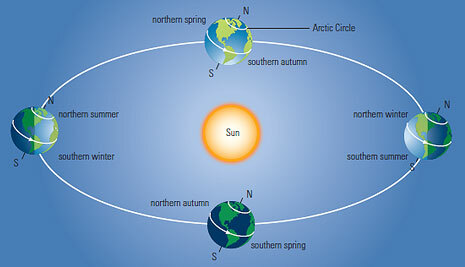 A planet without an axial tilt, and with a circular orbit (rather than elliptical), will tend to have fairly uniform weather bands across the same latitude of a planet because there is an even heating and cooling of the world. Our world's weather varies strongly because of the Earth 23.4 degree tilt on its axis. 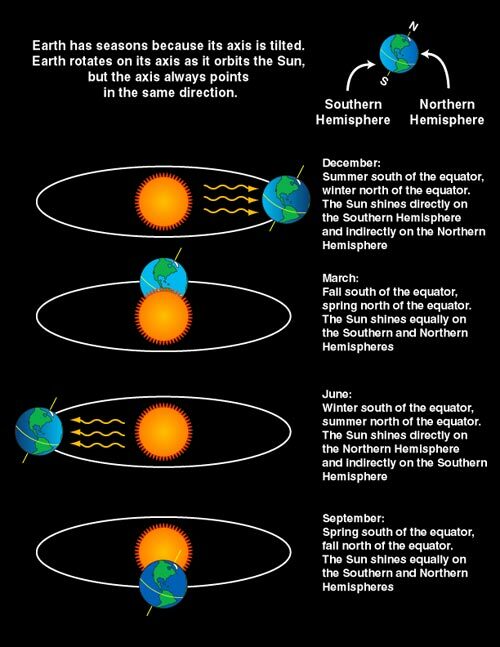 This tilt creates variability in our weather and in conjunction with our variation in distance from the sun can cause a wide variation in our weather patterns. The Earth's axial tilt is theorized to be a result of a Mars-sized body striking the Earth 4 billion years ago. This body may have knocked the Earth off of its normal zero degree tilt and altered weather patterns across the Earth since then. The other eight seven planets of our star system are fairly uniform: a hot, desolate marble (Mercury), an inhospitable greenhouse (Venus), a cool desert (Mars), and a bunch of gas giants. Even if you consider some of the larger moons, like Europa or Io, you still see some fairly uniform climatic features. The geological history of Earth suggests that we have gone through "Greenhouse" and "Snowball" periods where the climate would have been quite a bit more uniform. The variety in climate we see now could therefore be considered uncharacteristic or short-lived. The main reasoning is that the minds behind the stories being told have an idea or a concept they want to get across, which is an easier concept to send to the viewer/reader if the entire planet only features one biome. On Hoth for example they want to show how far out the rebels have been pushed, to what extremes, literal and figurative, they have been forced. As such it necessitates the entire planet being shown as an ice planet so no one has to explain why the rebels chose that ice-desert over a tropical region. On endor the idea may have been to show a less advanced group (rebels) over throw the more advanced enemies. To facilitate this, they force the juxtaposition of shield generators and AT-ST in the jungle. And work with common understandings of jungle dwelling civilisations being less advanced to show off the accomplishment is down to perseverance, not superior tech. H.P. Lovecraft wrote about this topic in an article in 1934, and criticized exactly these points in the 1930's: "Some Notes on Interplanetary Fiction (written around July 1934; Winter 1935)". And then there is the wonderful Supernatural Horror in Literature, which was aiming more generally at what makes fantasy/sci-fi literature and film adaptations rather predictable. Oh, and it's a very interesting insight into the history of, what he calls "Supernatural Horror." I have the text, but it's not in English... but he points at exactly the things that make 90% of sci-fi so very generic. Stanislaw Lem and the brothers Strugatzki went very different ways in that area. Hope this helped a little bit. Cheers! The issue is that we're talking about science fiction here. Note that while the genre in theory is not so young (just to give one example, Icarus could be considered science fiction, as it featured technology that made something possible that actually wasn't in that time). The concept of actually visiting different planets is (200 years is young in this context). Also, stories are essentially memes. I would argue there isn't a single truly 100% original story. Everything is ultimately tailored together (while still allowing for creativity and innovation) from ideas that the writer(s) picked up from other writers. Like the evolution of genes, the evolution of memes takes time (while it is faster by orders of magnitude). If you can't go to other planets you're stuck on earth. A scenery of a location is a functional element of a story if it's of any importance. For instance, if you tell the story of Columbus, an important element of that story might be the rough sea. That's a fixed location, as a plot element. Similarly there are stories that involve traversing a desert. Again, you're immobile because the roots of the memes that we keep evolving lie in a time, where you couldn't change location that fast. Now, if you write a story that involves planets, they're locations, and since the story is inspired by previous memes it makes sense that that location has fixed properties, such as being extremely cold. So of course you can introduce a planet with realistic heterogeneous climates, but in order for it to be actually part of the story, you have to come up with a story that genuinely involves these features, and you have little inspiration to work with. I think that Mike Scott is partly correct. However, there is another crucial aspect - useful land masses. Humans prefer to settle on land in places that have convenient resources (water, minerals, arable land). So, if a planet has only one continent, and that with an average temperature of -10C then it may not matter what the rest of the planet's climate is - people are probably going to think of it as an ice planet. In truth, we don't really know that much about planet formation and this gives writers tremendous latitude when world building. As long as the planets they create are within reason, given the climate factors that we do understand, nobody can really say that they're wrong. Most science fiction and fantasy is inevitably linked to existing story-telling tropes. So what would, in a traditional setting, be an (environmentally homogenous) city or country becomes a planet, a continent becomes a star system, the world becomes a galaxy and different races or cultures are translated into different sentient species. I think most books or movies only show a small part of the planets. Who knows what the rest was like? For the same reason that characters, events, places, and everything else in fiction are not as varied as in reality ... because the author is telling a specific story. Dune is a desert planet due to very important story considerations. It is a planet that has been undergoing extreme climate change due to organisms which lock away the water, leaving the entire planet effectively waterless. The ecology of Dune is a very integral part of the story. Other planets are barely mentioned other than in rememberings of the main characters or descriptions (Salusa Secondus was known as being a prison hell planet but the ecology of it was not really talked about). I'd like to add an answer with some science. If you consider the history of planet earth (e.g. at earth history, wikipedia) you will see that for most it's 4.5by history earth surface wasn't as diverse as today. There was a long "hellish" phase with volcanic desserts and greenhouse effect too hot for lakes. Desert phases as no plants were around to gr (just look at Mars). and even some snowball phases (snowball earth) where even at equator temperatures were as low as nowadays Antarctica. So there is definitely some scientific logic of expecting some planets to be completely desert or frozen. Forest and jungle planets are a different story. It may suffice that a "planet" is small enough. Endor is actually just a moon. But that's all speculation. I personally think it was a product of the early adventure novels/comics since those often ended up with people sailing to other islands that are similar but different to known earth, and it made them seem far away exotic and special. Meanwhile planets as variable as earth don't seem, as memorable or special. RPGs are like this too, your opening country usually has multiple cities, then later each other region has one city. We do this in real life too, the more further out the more we try and associate each area with something simple. For example I used to think spain was just colorful buildings, flamenco and bull fighting in every city. Then I went to 3 different cities extremely close to each other there and they were more varied than New York, Calgary, and LA could ever be to each other. Not the answer you're looking for? Browse other questions tagged science-fiction-genre or ask your own question. Why do planets in Star Wars only have one environment? Why do anthologies have such a prominent place in the history of written SF? What was the first SciFi work that theorized that Homo Sapiens were seeded on Earth by intelligent aliens? Where does the archetypal image of the 'Grey' alien come from? Why do (some) people consider “The Heat Death of the Universe” to be science fiction? What is the origin of the word “terrans” when referring to humanoids and other earth-related things? Who was the first ape in science fiction? What was the first alien probing?